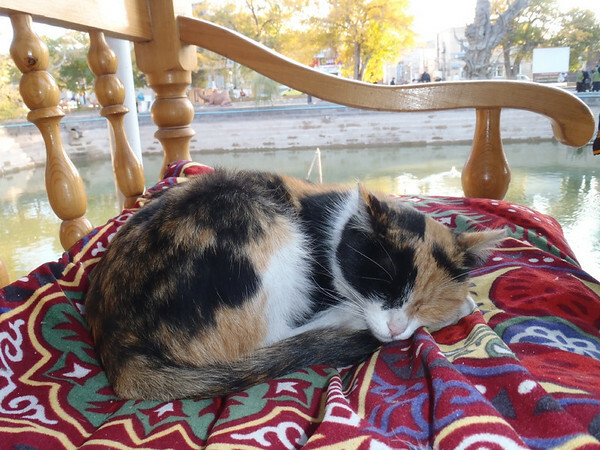 Waiting in Tashkent for the Turkmenistan visa brought me unexpected emotional lows. Without having the day-to-day activity of riding and looking for food, fuel and camping spots, my mind was free to dwell on the things that I left behind: home, cat, family, and friends. Some psychological bills came due and there were a few blue days to slog through. I went back to the embassy, and 5 seconds after the consul’s stamp hit my passport with a thud! I was out the door and heading south-southwest toward Samarkand. I found myself riding well into the night, breaking one of my own cardinal rules about safe motorcycle travel: Never ride after dark. If this is a good rule in the US, it’s a grand one in Uzbekistan, with poor road conditions, animals and pedestrians on the road, and vehicles with no lights (some driving the wrong way on a divided highway!) Add to that the difficulty of scouting for campsites after dark, and I was cursing my poor judgment at midnight while I pitched my tent in the hills near a garbage dump. 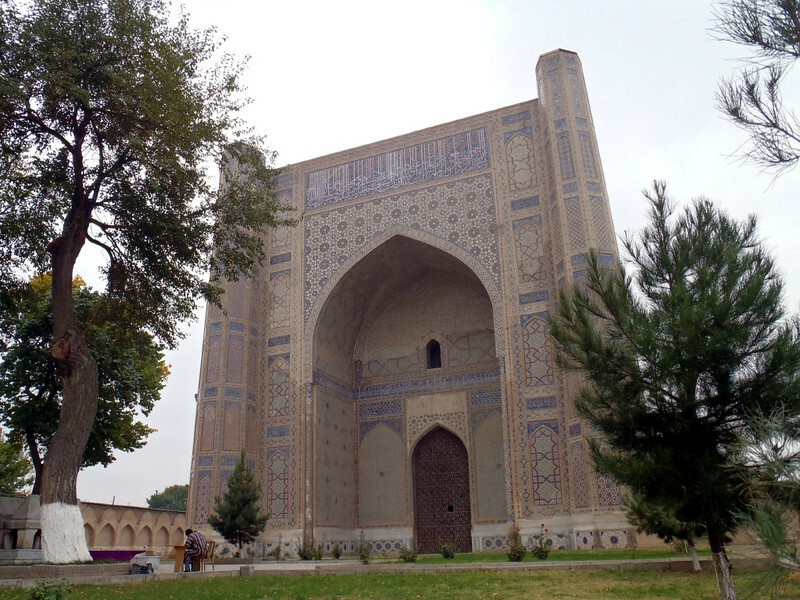 The next day I arrived at Samarkand late in the morning and easily found the first bit of Timurid architecture. Bibi-Khanym Mosque, built between 1399 and 1404. 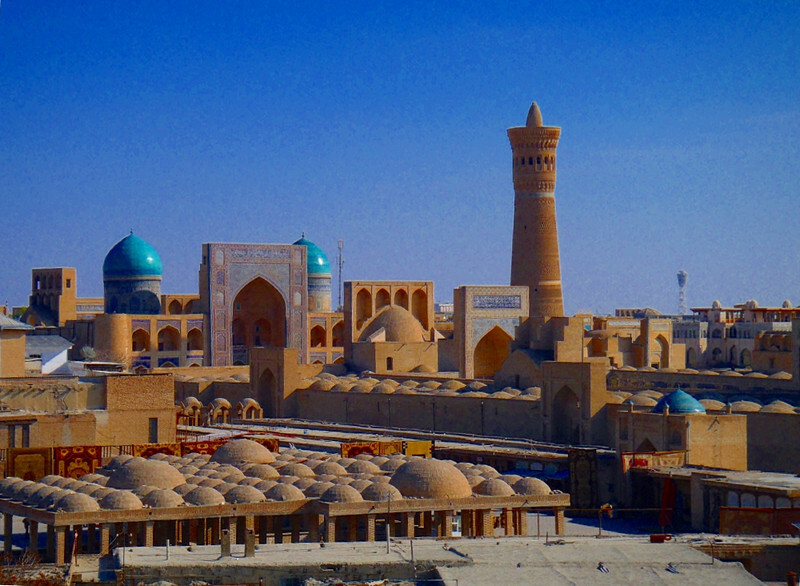 A short distance away, past trendy souvenir and gift shops, is the Registan. 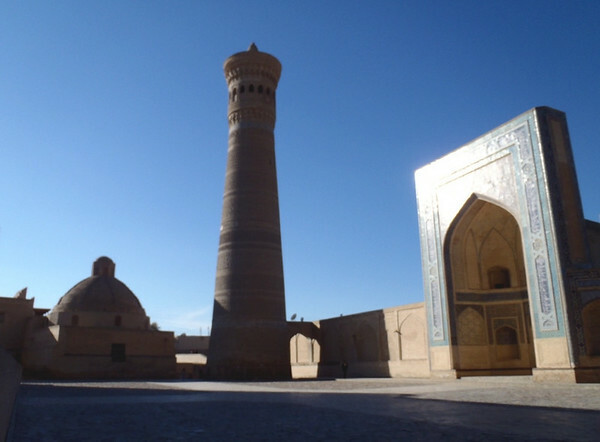 The oldest of the three buildings, finished in 1420, is on the left, and is called the Ulugbek madrasah. While inspecting the tile work, I was approached by a policeman who said he could get me access to the top of one of the towers for a few thousand som. Sure! 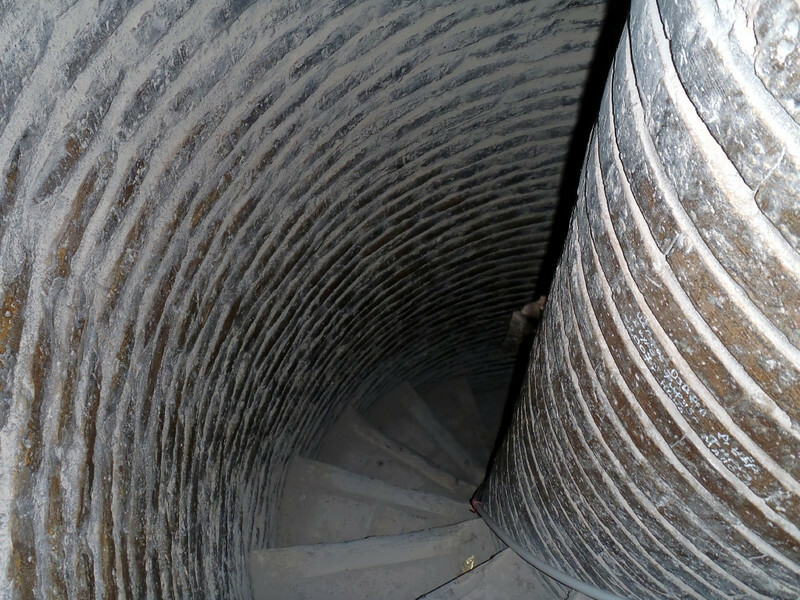 He unlocked a gate at the base of the tower and I started a claustrophobic ascent up the spiraling stairs. Looking down the staircase. The passage was barely wider than my shoulders. Handy arrow slits for fighting off invaders. The view from the top was OK.
A little vertigo goes a long way. 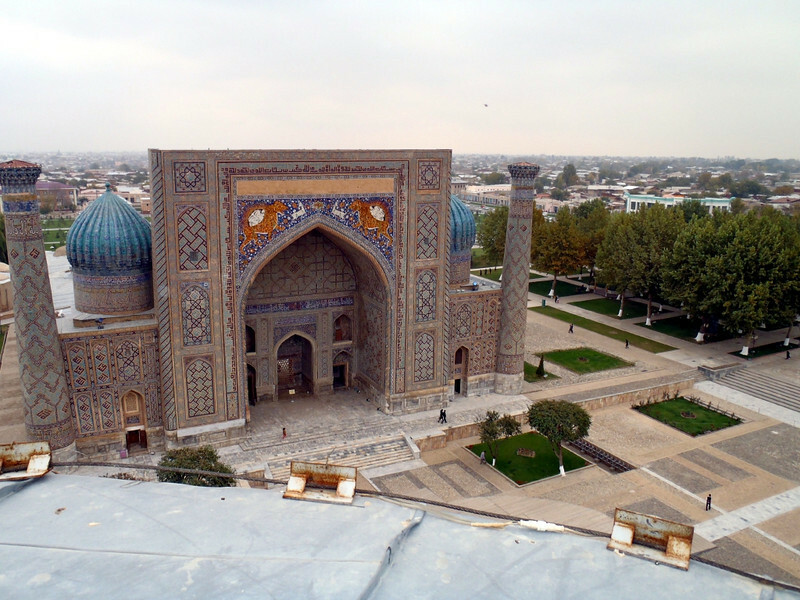 There’s more to see in Samarkand, but I was eager to make more miles toward Bukhara and the Turkmenistan border. In my haste, I made the mistake of leaving the city limits with only about 70 miles of fuel in my tank, and as I rode along I noticed that all of the gas stations were closed. All of them. And after 40 miles realized that I needed to backtrack to Samarkand to fill up. I camped for the night in an orchard and planned to do the backtracking in the morning. 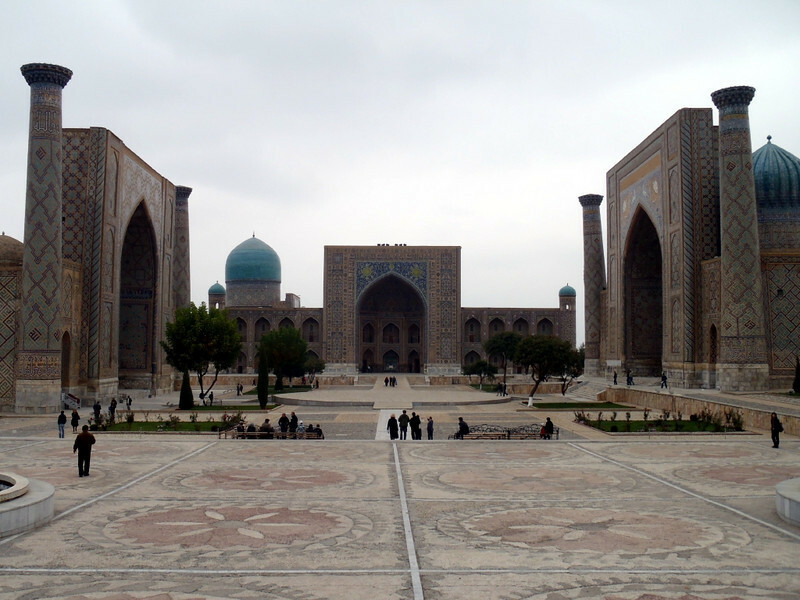 When I did get to Samarkand I joined the first queue of several dozen cars. After talking with some of the other fuel-starved Uzbeks, they said I should go to the front of the line. When I asked if the people ahead of me in line would get upset, they said, “No! You are our guest! Just say ‘America!’ ‘Obama!’ and it will be fine!” Well, no such fanfare was required, but I had to pay a few extra bucks for my fuel, and also slipped a few to the guy who arranged my line-cutting exercise. I crossed into Bukhara just as the sun was setting, determined to check in to the first hotel I could find. I raced around with the commuters, delivery vehicles, taxis, and marshrutkas (small vans/mini-buses that have established routes, inner- and inter-city), until I found the Hotel Sharq. The next morning I asked the clerk which way I should walk to see the sights, and set off in the direction of his arm wave. About five minutes later I’m looking at the 880-year-old Kalon minaret. Chinggis Khan liked it so much he didn't flatten it. 154 feet tall. 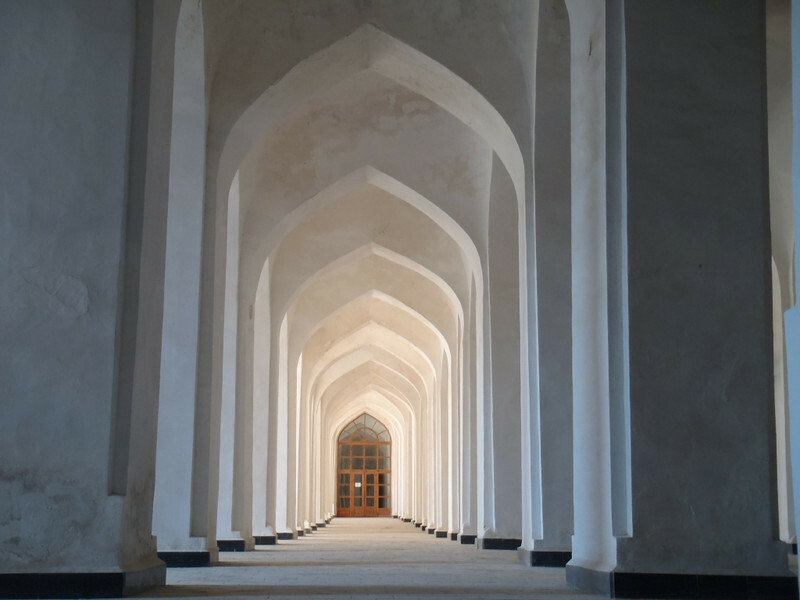 Within the Kalon mosque (to the right of the minaret) are cool halls with neat-o arches. While I was wandering around the Ark (link) a man approached me and asked if I was interested in seeing a special part of the site. “Big surprise!”, he said. “12,000 som!”, he said. “Well…OK…but wait.” I’d seen a lone backpacker earlier in one of the ark museums, and since she was walking by, asked if she wanted to see this mind-blowing mystery sight. Fortunately she’s the adventurous sort and agreed, and we were directed to a locked gate which was soon opened by a guard. We walked over partially excavated mounds, with some digging in progress, until we reached the eastern wall of the ark. 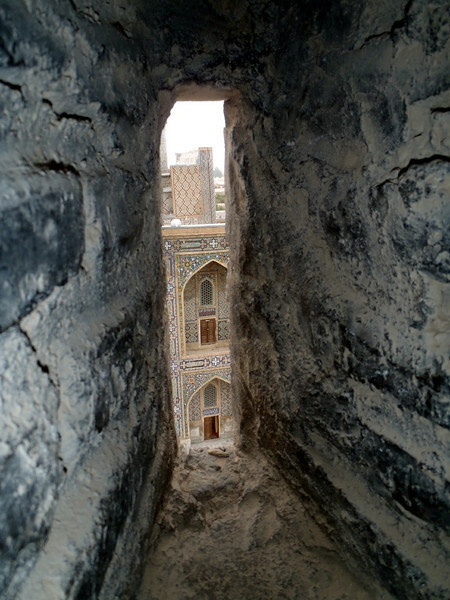 The 12,000 som view of Bukhara's Old City. (That's about US$5.) The smaller dome clusters cover bazaars. Camera-shy Tiina from Finland and I teamed up for more local sightseeing, and decided to grab some dinner at the Lyabi-Hauz, a 17th century plaza built around a pool, surrounded by ancient massive Mulberry trees. We had some company. We joined forces again the next day for some out of town sightseeing, and after a passable Italian dinner, said our farewells. It was a pleasure connecting with a fellow traveler! Bukhara (and indeed, all of Uzbekistan) was experiencing a fuel shortage, and the lines at the pumps were dozens of cars long, and not moving. No one could say when fuel would arrive at the stations. And the clock was ticking away on my 5-day transit visa for Turkmenistan. Again I was urged to go to the front of the line, where I waited with everyone else. After meeting some of the locals and chatting a bit, offers came up to buy black market fuel, and I took the 4th or 5th one, after the insultingly overpriced offers had been made and refused. With a horn honk and a wave I started making miles for the Turkmenistan border. #1 | Written by sarah about 8 years ago. That Kalon mosque photograph is amazing, Sean. Are you using any software to correct lens distortion? Because I don’t know how you got those lines so straight, if not. I’m sure people have already suggested this, but with your insightful photography and descriptive prose, you should really consider self publishing all this in a slick coffee table type picture book once your trip comes to a close. #2 | Written by April White Jeras about 8 years ago. Now, NO more riding after dark! #3 | Written by Sean about 8 years ago. Thanks for the kind words Sarah! The only post-processing I do to the photos is white-balance correction and cropping, and 1 or 2 degrees of rotation if I get the horizon crooked. The camera is an Olympus Tough 6020, and has served me very well. I haven’t used the DSLR in quite a while & may ship it home. #4 | Written by sarapearl about 8 years ago. Sean, I’ve been getting your postcards. Thanks! What an amazing and unique experience. Thanks for sharing it with us!